While I was studying at 10th standard, I used to play with small electronic circuits mostly based on transistor bc547 - bc557 pair. 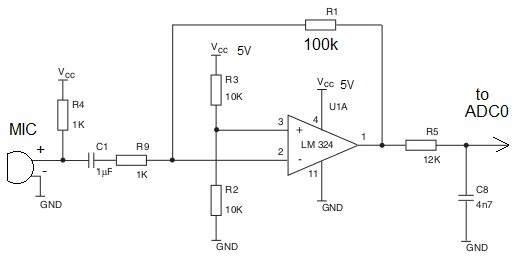 At that time, I just asked myself, I can amplify audio signals using few transistor combinations, but how can I make an echo effect which I used to hear in almost all loudspeaker announcements? I can't imagine what I can do with few transistors and resistors to make such an effect! I have no answer at that time because it was beyond my limitation.. I am using an Atmega32 microcontroller for the purpose. It is having RAM of 2KB and an ADC which is enough for demonstrating the concept of echo generation. An electert mic is used for capturing the voice. 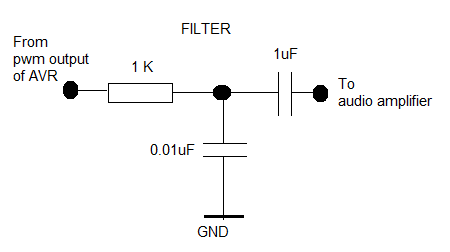 It is introduced to ADC with proper amplification and level shifting, which are more critical for the perfect operation. Now the ADC module inside the AVR will convert the analog signal to digital signal at a particular sampling rate(which we can decide). 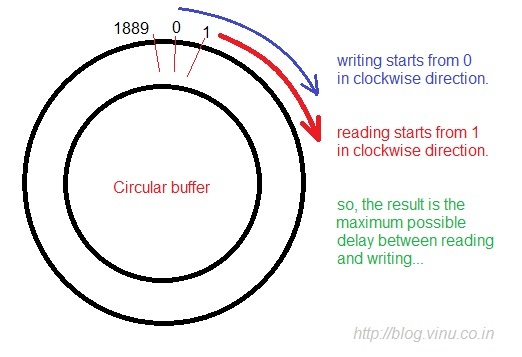 Now a 1900byte circular buffer is introduced. Our first aim is to make a delay in input and output audio. So, we can do one thing, ie we can populate the buffer from one end and we can read the buffer from another point so that there will be a delay! So how to make this delay to it's maximum? I think it will be better to explain it via a diagram. In my demo code, I also provided a 5 level echo selection via external push button, ie echo 0 to echo 4. We can do a lot of adjustments here. If we increase the sampling rate, the echo time gap and echo duration will be reduced but the audio quality will be increased. If we are decreasing the sampling rate, the echo time gap and echo duration will be increased. If we increase the feedback gain (but always < 1), the echo volume and echo number will be increased.. If we increase the feedback gain above 1, a totally disturbed audio is obtained due to oscillation. 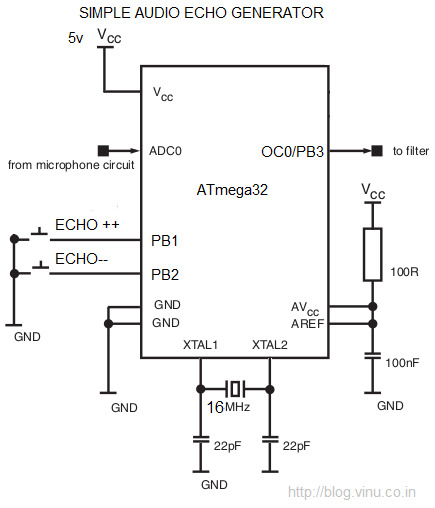 To obtain a very good audio quality with good echo effect, both the echo buffer (RAM) and the sampling rate should be high..... Atmega2560 may be best for the purpose because it have 8KB RAM. Now, for an audio amplifier, just search in google, we will get a lot of circuits which suits for our speaker specifications. So, I am not putting the diagram here. Still couldn't find it, just mail me. I will suggest suitable amplifier for your speaker. Very nice work! I saw your project on hackaday.com! Could you adapt your code for Arduino please? I see you use a 324 opamp, so you have three unused opamps, if you want to increase the audio quality (with this chip) you could split up the signal, so the Dry signal, the original one is not running trough the AVR, so it's quality is independent of the sampling rate/bit depth, and run the output from the avr and the original signal into a virtual earth mixer. Then you could even decrease the bit depth/sampling rate and give a longer lo-fi delay effect with the original quality dry signal. Or even use analog feedback of the delay signal, this could give a much better control over the amount of the delay and you can put additional filter in the feedback loop, so the "older" signal is less high freqs, like in an analog delay. And that would also give the ability to chain more smaller,cheaper AVR-s after each other for longer delays! Nice job ! Very inspiring. I did it on an atmega328 and I have some remarks. 1. Why using two counters ? You don't need to start writing at 0 and start reading at 1. Both can be done from 0 by using only one counter (i in your case). 2. By doing the test of the counters after incrementation at1899 you are loosing one sample. The test should be at 1900. 3. On your figure, it should be 1899 not 1889. (actually, that's more than silly!). Great work. but how could be extend the delay? in audio buffer? which is buf? should i increase the array? Здравствуйте. Собрал я это устройство. Но у меня все гудит и звенит. Что я мог сделать не так? Подскажите какие фьюз биты нужно установить? Я использовал стандартные. И на входе у меня не микрофон, а гитара. Когда я бью по струнам гитару если если слышно в очень искаженно виде. Помогите. Я начинающий. Hi! I'm Rolando from Peru, I saw your video and it really impressed me!...My question is wheter I can generate a 8 bit song with an atmega88. I'm planing to implement a guitar hero simulator. Help me please! Any idea you can give me will be helpful, well I'll wait for your answer; thanks! oh THANKYOU. :) i've been banging my head on the wall trying t work out circular buffers and delays for a project adding reverb (echos) to a wav file playing from an SD card. Your example has solved my problem!! Thanks again. Hello, your project, it's really cool. Could you use a serial memory to improve the sampling? nice effort. atmega32 is really best. can use an external ram spi for supply more ram? why not using external ram? really cool project Vinod! what IDE are you using to program the ATMEGA32?